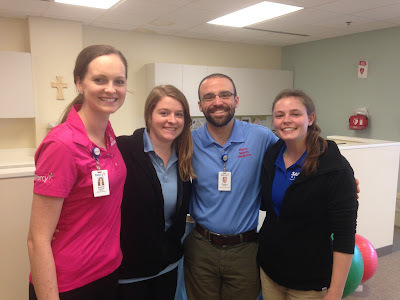 During the month of February I had the opportunity to do my mini rotation at the Mercy Clinic and was very impressed with how they did things. I got the chance to talk with Dustin Jamboretz, MAT, ATC (SLU MAT Class of 2016), and see how he likes things there. There are primarily athletic trainers who work in that clinic, which is very cool. As I was talking with them over their lunch break, I learned that they think about the whole body and not just the injured body part like many clinics do. I think it is great that they work with one patient each at a time for 45 minutes instead of trying to work with two or more patients at a time. I was also introduced to the DMS machine, which every patient loves. DMS stands for Deep Muscle Stimulator. This machine, as it was described to me, feels like a concentrated massage in one area. They let me try using it on a real patient after watching them use it twice. The athletic trainers are also very open to having the student provide input in how to get the patient to perform an exercise properly or different ways to give cues to the patient. After you see the athletic trainers teach the patient how to perform different exercises they include you in the patient's rehabilitation by having the student explain how to do the exercise. The athletic trainers not only include you in performing the patients exercise but they ask you questions and make sure you noticed what they saw if the patient was compensating. For example, I had the opportunity to create the exercises for a patient for their therapy session along with making changes to those exercises in order to make it easier for the patient. In addition, I had the chance to break up one end goal exercise into multiple exercises to get the patient to perform the exercise properly. I thought this was a great experience and I love that they realize that students who are with them are there to learn and practice hands on things. The Mercy clinic is a great experience because they do not just have you sit and watch what they do, like we did junior year with our observation hours, but they engage you in the patient's session.